Music Lovers Treated to Beautiful Music and Glorious Weather at TCMF! AUSTIN, April 24, 2010 — Hundreds of appreciative music lovers were treated to a fabulous Saturday afternoon of music and clear sunny skies as the Fifth Annual Texas Community Music Festival resumed at Central Market North. Day 2 of the TCMF opened with a performance by the host organization, the Austin Civic Wind Ensemble, under the direction of Maestro Robert Laguna, who rewarded the early audience with a challenging program of concert band literature inspired by classic literary works. Next up was Passing Measures, one of the region’s premiere Renaissance ensembles, performing on Renaissance period instruments. The Austin Wonderbrass followed with a program of traditional British Brass Band literature. The Festival continues through 9pm Saturday, culminating w2ith a show by Latin jazz favorites, Ritmo 3, at 7pm. 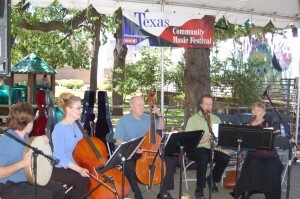 Music begins Sunday at 10am, at Central Market North. Please check the Schedule page for more information and check back throughout the day for more updates.